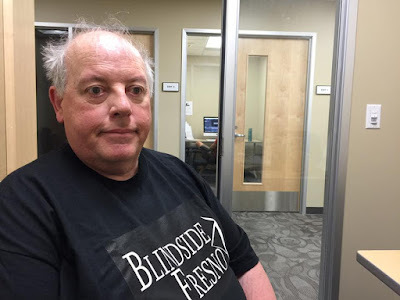 One of the worst mistakes I made on the first program of 'Blindside Fresno' was to not take the pre-production phase as seriously as I should have. A lot goes into pre-production; creating titles; setting out end credits and notices and also checking on the timings of program breaks. William Elliott (Producer) in Editing Suite. It was not laziness that caused me to miss out these things. I hadn't got the skills to make these things happen and I underestimated the time I would be waiting for the neccessary portions to be created. So this time I decided to hit the editing suite with Darcie, my wife and the host of the show, she has recently taken the neccessary courses at CMAC herself so is able to use the equipment there. Leif, My Guide Dog lies in harness under the computer desk. along with Leif, we actually spent two full working days down at the CMAC studios, creating new graphics packages for the titles, credits and we are adding a short film break in the middle of the program too. A new feature for this next program, but one we hope to include in future episodes to add information such as technology spots and comedy sketches. We'll see how they work out. 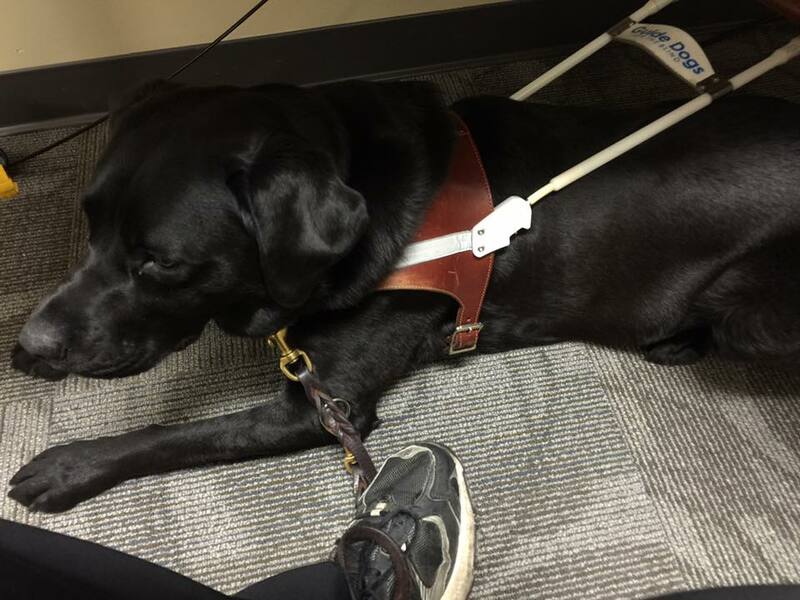 The hardest part for Darcie was to recall all of the information she learned in the very comprehensive classes. Learning to operate a professional editing program in two afternoons is pretty tough. We did find the regular staff members at CMAC very helpful in this case, as always. Taking time to explain what sequence of menus she needed to complete a particular task. Thanks Bestina, Charlie and Johnny. for all the help. It took about fourteen hours work to create all the new portions of the program. But these fourteen hours take up only about four or five minutes of show time but they will save time in the long run because under our system we now have only a template for the credits, this template will take just about ten minutes to change after every program rather than several hours recreating a end credit sequence. 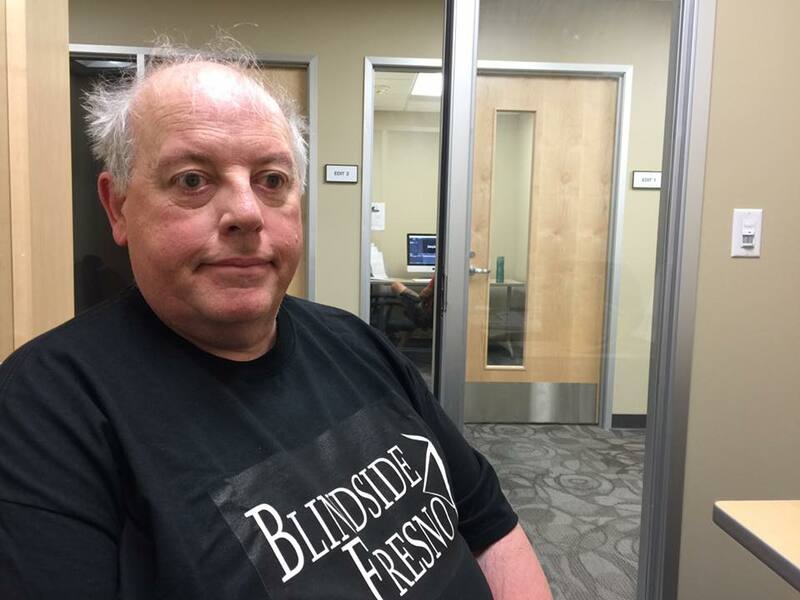 To see regular updates of behind the scenes operations at 'Blindside Fresno' Like "Blindside Fresno' on FaceBook.